First off, we would like to thank all of the amazing Portland rehab specialists who made it to the Michael Shacklock Upper Quarter Neurodynamics continuing education course. We had a good mix of Chiropractors, Physical Therapists, Athletic Trainers and other rehab specialists. We have had great respect for Michael Shacklock's book since our Physical Therapy school days and believe many who took the course share that same admiration. Not only did Michael exceed our expectations as an instructor, but he's a really good guy. We feel very lucky to have gotten to know him over beers and food. The following are some photos we took that best capture the Jetset Rehab Education spirit and the way we organize a continuing education course. We are looking forward to build on the many friendships we made during our time in Portland. The following photo diary is from the Upper Quarter class only. The Lower Quarter class photos will be shared next week. If you would like to request a specific image, please email us at JetsetRehabEd@gmail.com and we will reply with a raw copy of the selected photo(s). Please note: later this month, all photos will be shared with students on a website and available to download to share on your blogs, websites, social properties and etc. At Jetset Rehab, we believe it's important to provide all assets that help our students' businesses thrive and succeed. Taking a continuing education course should allow for not only learning but networking. It is our hope that sharing videos and photos can assist with this. If you haven't yet, please check out our Continuing Education Course for Movement System Impairments in Hawaii on Oct. 21-24. For feedback on the photo diary, please email jetsetrehabed@gmail.com or leave comments below. 5:30am Wake up and start to prep for the class. In an hour, we have to pick up Michael Shacklock and take him to Pacific University where it all begins. We start the morning learning how tension on a contralateral nerve can take the tension off of a painful nerve. See the video below where Michael Shacklock (left) explains this concept. Thanks to Michael Shacklock for allowing us to use this video! We are thankful to those who decided to attend the class. Nothing but positive energy. Michael Shacklock demonstrates the palpation of the Median Nerve as students look on. We can't stress this enough, limited class size allows students to get the most out of their experience. We take pride in knowing that everyone gets the opportunity to ask questions as well as one-on-one interactions with both the instructor and fellow classmates. Michael Li (pictured here) is going to partner with Jetset Rehab Education for another continuing education class with Michael Shacklock on March 17, 2017. Follow us on social media for registration updates. Yes, we Have an amazing chance to improve the way we analyze movement. This class will be amazing! Michael Shacklock observes and palpates the Ulnar nerve. One can observe differences when comparing sides if one area has inflammation. Lunch time! We cater many of our classes with high-quality food. Thanks to Maggie's Buns for the amazing spread. The leftovers were donated to Pacific University students who pretty much cleaned it out in minutes. Later in the afternoon, we start the lab portion of the course. In this photo, every detail of the neurodynamic tests were reviewed piece by piece. In Photo - Allen Rubin. Scot Morrison looks on with skepticism. Check out an old podcast we did with him HERE. Joey Salgado, a Jetset Rehab Concorde club member and physical therapy continuing education student, came all the way up from the Bay Area where he runs his Private Practice clinic: Progressive Motion Physical Therapy. Andre "The Great" Chavez with Michael Shacklock. 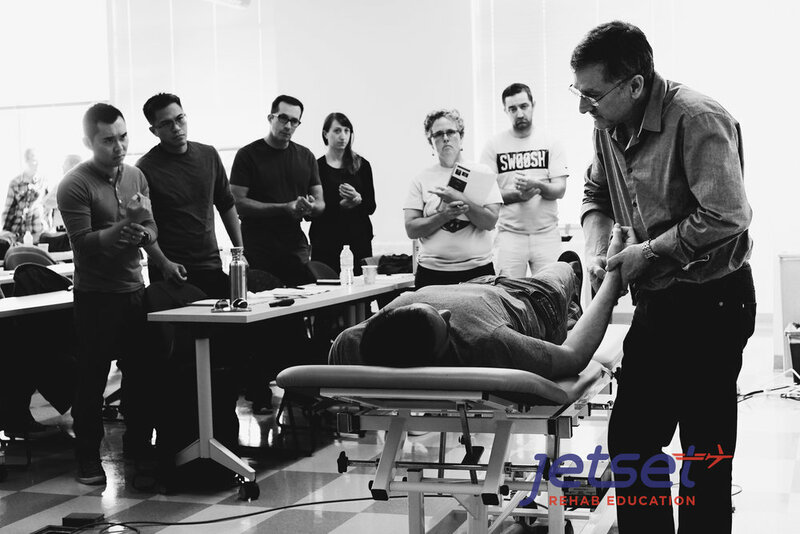 Andre teaches for Movement Links and helps Jetset Rehab Education organize continuing education courses for Chiropractors, Athletic Trainers and Physical Therapists. He and the Jetset Rehab team collaborated on a case study which was published in JOSPT. Handhold details are stressed in this course. Median Nerve test pictured. A small class size is very important! It's ok to ask organizers how many students will be in the classroom. If the class size is too large, this moment is not going to happen. Joey Salgado demonstrates the Radial Nerve test. The differentiation is at the scapula which he is stabilizing at the hip. Michael Shacklock speaks as Scot Morrison and Phillip Snell look on. By the way, Phillip Snell has a great website which we admire for the detail given to each post: CLICK HERE TO VISIT. We are very big on networking after class, hence the hashtag #stayafterclass. We met up at a brewery with the instructor so our students could discuss the class, life, business, sports or anything else over some great food and beer. Wouldn't you rather leave the classroom and discuss Neurodynamics here? DAY 2: Phillip Snell and Scot Morrison with Michael Shacklock. Day 2: in class discussion. Justin Dean and friends. Justin is doing some great work with Rehab 2 Performance (R2P ISCRS). Stay tuned for an upcoming podcast with Justin and Phillip Snell. We would like to thank Ecliptic Brewing for the great service and amazing food and drink. The space was amazing. A great time networking and meeting new friends. Nice of Katherine Finn @ktptdpt to stop by. She attended our Las Vegas course but we love to invite former students to our networking events when we are in their town. Justin Dean in the Ecliptic Brewery. Brewery scene. All food and drinks were included as part of our networking experience in this class by the way. Jay Bhatt, Co-Founder of Jetset Rehab Education, Scot Morrison and Phillip Snell. If this sounds like something you'd be into, Please follow us on social media and tell a friend. Subscribe to our podcast and check out our next class in HAWAII!!!!! Please follow us above and stay tuned for our podcast with Michael Shacklock next week. Randal Glaser PT, DPT, OCS, CEAS I is a co-founder of Jetset Rehab Education as well as the Clinical Specialist for the Santa Clarita Kaiser Permanente Physical Therapy Clinic. Founder of Harmin Ergonomics. He is also a freelance photographer and former film student as well.